A while back, a reader wrote me to request more on Jordan's late Queen Alia. Well, I suppose that would be a request for anything on Queen Alia, since she's never appeared here before. Truthfully, I don't know much about her, but I do know this: one of my favorite tiaras from the Middle East originated with her. 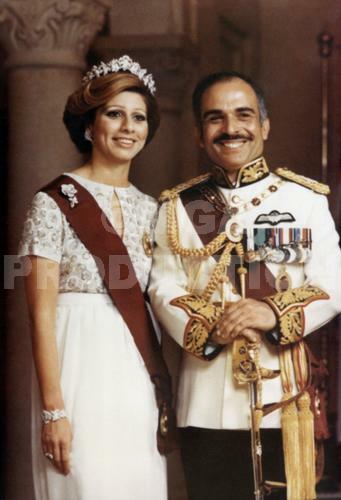 That's Queen Alia above, with her husband, King Hussein of Jordan. Alia was Hussein's third wife; his first two marriages ended in divorce. It was King Hussein that gave Alia this stunning diamond tiara from Cartier (which we will appropriately call Queen Alia's Cartier Tiara). On a non-tiara note for just a second: Alia was quite an interesting figure. She was the first to really develop the role of queen consort in Jordan - the modern, working model that Queen Rania exemplifies today. She died tragically in a helicopter crash in 1977, leaving behind three children: Haya and Ali, and an adopted daughter named Abir. Hussein would marry once more after Alia's death, to Queen Noor. Here's what's interesting about this tiara: it has a sort of Monet quality to it. From afar, you think you're in for a classical design. Maybe it's a take on the fringe; maybe some sort of flowers are happening on there; maybe it's a filigree design; could it be snowflakes? But then you get up close, and you realize that it's actually quite random and modern. Rania shows off the versatility of the tiara with her varying hairstyles, but she also shows one of the downfalls: the halo effect. Without a good base of hair to set on, it floats - leaving a good amount of space between the head and the diamonds. Too much space sometimes, if you ask me. What do you think?